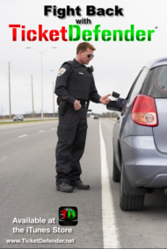 Fight Speeding Tickets With The Newely Released iPhone App, ‘TicketDefender’! TicketDefender tracks and reports vehicle’s speeds to protect drivers from undeserved speeding tickets. TicketDefender is a newly released iPhone App that enables drivers to protect themselves from undeserved speeding tickets by providing a printed report that shows their vehicle’s GPS speed and location prior to the issuance of a ticket. Police radar makes mistakes, lots of them. In America more than 100,000 people per day receive speeding tickets. Some experts estimate that 10-20% of all radar-backed speeding tickets are issued in error and in the case of radar operated from a moving police vehicle the number of inaccurate tickets may be as high as 30%! Yet, the use of Radar is widely accepted and we naturally assume the technology is reliable (1). But good news is just an Apple App away. After a truck driver received one of these erroneous speeding tickets, he decided that something had to be done. He presented his idea to a friend who is an engineer, and TicketDefender was born. 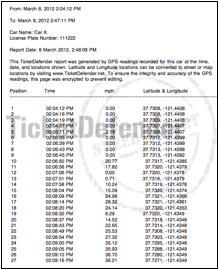 As a user drives their vehicle TicketDefender automatically records the speed, time of day, and GPS location. If the driver is pulled over for speeding, he simply clicks “Press When Ticketed” to capture the last hour of data and generate the free Speed Report and free Map Report. Instructions for how to print these non-editable, encrypted and watermarked Speed and Map Reports are sent to the driver’s email address. These two reports can be used in court as evidence against wrongfully issued tickets to protect drivers from “the officer’s word against mine” situations. 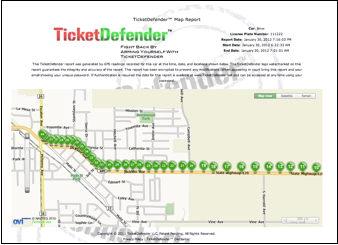 The TicketDefender Speed and Map Reports include the vehicle’s make and model, license number, time and date, the vehicle’s speed recorded every 3-5 seconds and a map showing the vehicle’s location and corresponding speed. If the speed on the TicketDefender report is different from the speed indicated on the ticket, the driver has a valid "not guilty" argument. This report can then be presented in court or with employers in defense of inaccurate speeding tickets. Radar can often clock incorrect vehicle speeds causing an unwarranted ticket, but until the release of TicketDefender there has been no way for drivers to prove that they were driving at a speed that was different from the speed stated on the ticket. TicketDefender can be a valuable tool, both for fighting speeding tickets and for proof of speed at the time of a car accident. TicketDefender is certainly a benefit for any driver or commuter and particularly beneficial for individuals whose livelihood depends on a positive driving record such as truckers, bus and taxi drivers. TicketDefender will track any vehicle in which the phone is located, once the vehicle’s data has been entered. One TicketDefender download can be used for multiple vehicles including company and family member’s vehicles. TicketDefender will also multitask; it continues to track speed and locations while you use the phone and other applications. The one time download of TicketDefender can be used repeatedly to give a lifetime of protection from undeserved or inaccurate speeding tickets. Developed by Zco Corporation, TicketDefender for the iPhone is available at the iTunes store for an introductory price of $1.99. To learn more about this exciting new App visit http://www.TicketDefender.net.